One of the most valuable parts of coming to the Jayhawk Media Workshop is a preview of what it’s like to live on a college campus for five days: to walk past historic landmarks down Jayhawk Boulevard on your way to courses each day. We will make every attempt to accommodate roommate requests. Under no circumstances will students be allowed to change rooms unless approved by the director. Your room is furnished with bunk beds, a large closet and a dresser. Please do not rearrange the furniture. Rooms are checked prior to arrival. Any damage during the week of the workshop will be assessed to you. The residence hall has 24-hour security in the main lobby; all exterior doors are locked 24/7. Students must use their access card to access the building using the card swipe system. In addition, we have one full-time adult residence hall director who works only with Jayhawk Media Workshop students and staff. Additionally, for approximately every 15 Jayhawk Media Workshop students, there will be assigned one counselor. Most of our counselors are KU journalism majors who are capable of helping students with their class assignments. The Jayhawk Media Workshop considers the University of Kansas a safe campus. However, we encourage students to keep their rooms locked when unattended. Since we do require night classes, we ask students to walk to and from the dorm in groups. No student should leave classroom buildings alone to walk back to the dormitory. If necessary, a counselor at the residence hall should be contacted. You will be issued a room key, a meal card and an access card. Lost keys that result in a lock change will cost $50. 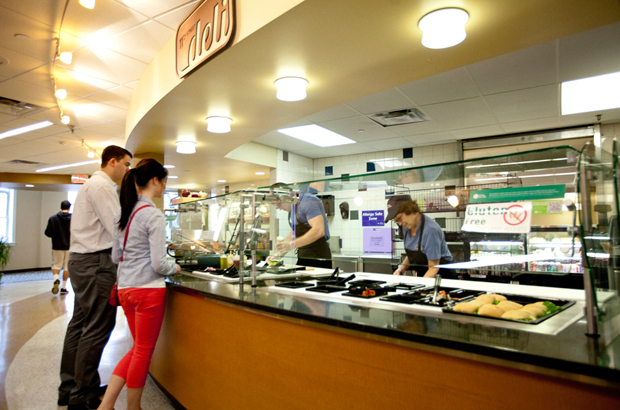 There is no fee to replace meal cards or access cards. Lost cards should be reported to the dorm director for a suitable replacement. Remember to turn in your key at check out Thursday morning following the closing assembly. All Jayhawk Media Workshop students need to vacate the residence hall by 11 a.m. or an additional day’s room charge will be assessed. Check out for all residents will take place on the individual floors of the residence hall. Meal service will be provided for JMW students. Students will be eating all breakfasts and most dinners at campus dining. Breakfast will run from 6:30 to 8:30 a.m.; dinner from 5:30 to 7 p.m. For lunch students will get cards good at either The Underground at Wescoe Hall or at The Market in the Kansas Union.